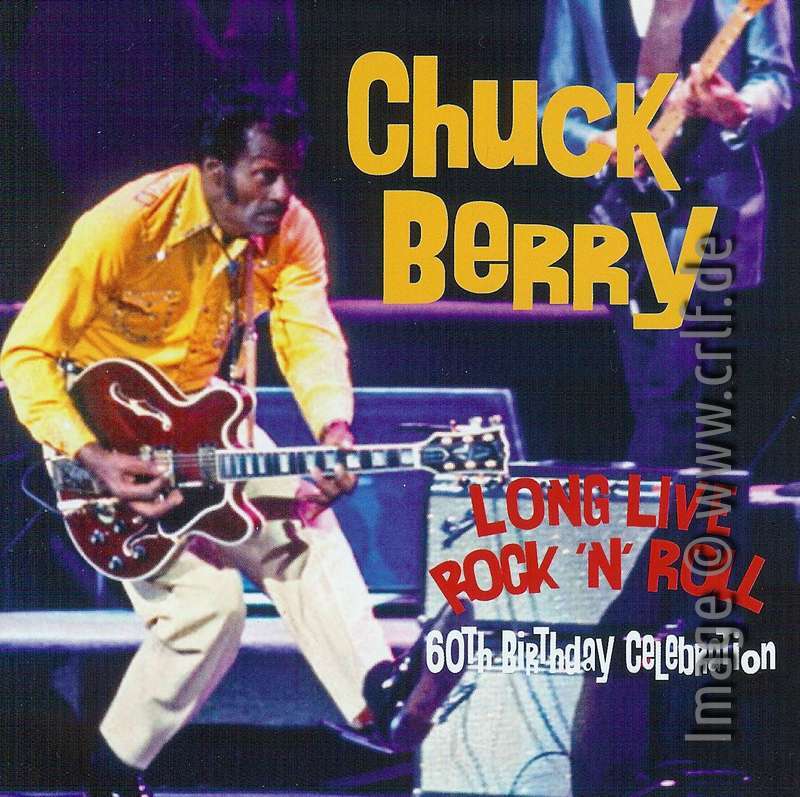 In 1986 MCA Records celebrated Chuck Berry's 60th birthday by filming and recording a live show held in St. Louis, Missouri. 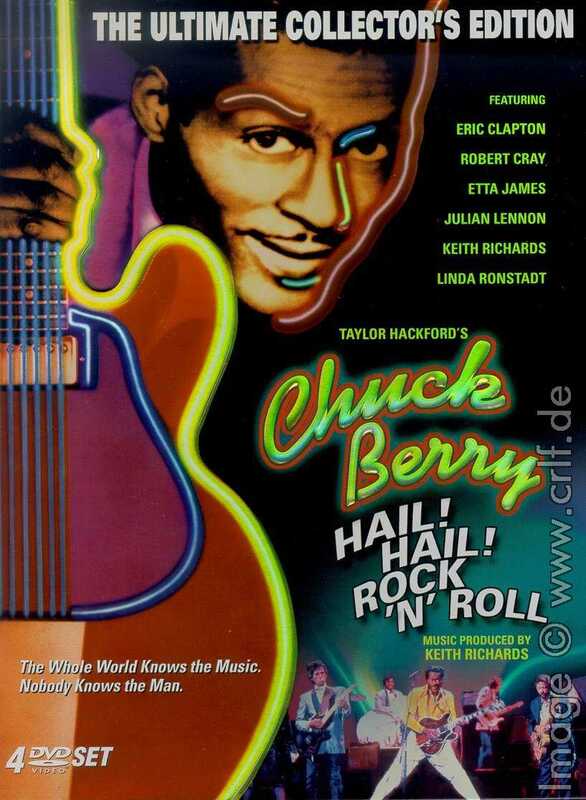 Chuck Berry was backed by an All-Star Band including Keith Richards, Eric Clapton, and Robert Cray with vocal accompaniment from Julian Lennon, Linda Ronstadt, and Etta James. Parts of this show - which were in fact two shows held within a few hours - have been released by MCA as a rock documentary film, directed by Taylor Hackford, called Hail! Hail! Rock 'n' Roll. For many years, the film had been available on video tape only. The video as the original movie contains recordings from the shows as well as interviews, segments from other live shows and rehearsals. In 2005, segments from the film surfaced on a bootleg DVD which promised "unreleased excerpts". It did not fulfill this promise, though. 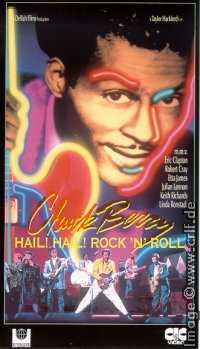 The DVD Chuck Berry - Rock & Roll Years (PINUP Productions) contains just some parts of the original video tape and even those in less than optimum quality. It does include additional twenty older TV and movie clips, though. A One-DVD package has been produced for Hearmusic, the music division of Starbucks, the coffee shops. This One-DVD version was for sale only in the Starbucks shops in the U.S. and Canada. It contains the complete movie, an introduction by director Taylor Hackford (with an advertizement of the upcomming more-DVD versions), plus short excerpts of interviews Hackford recorded with other Rock and Roll stars. 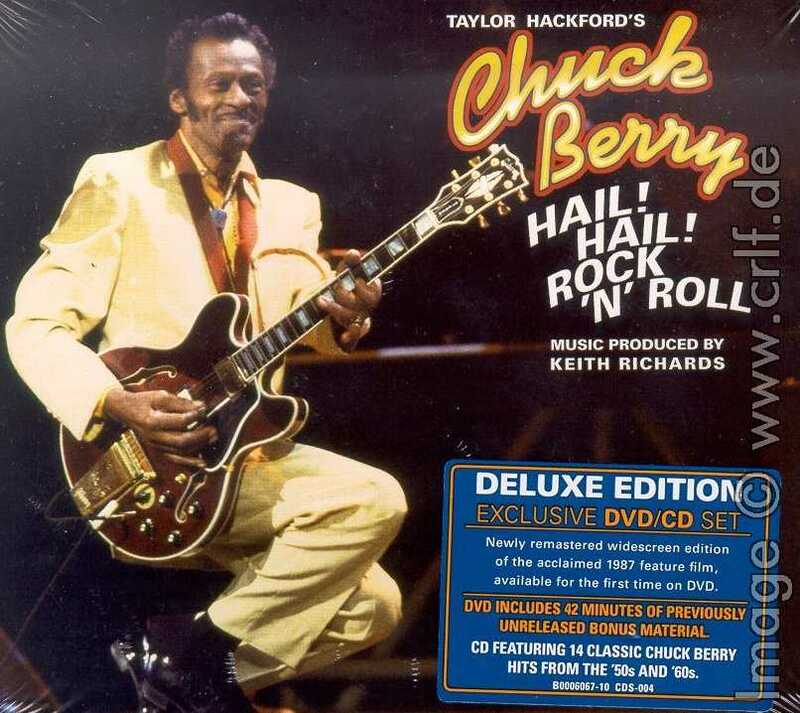 The DVD came bundled with an audio CD containing Chuck's greatest hits. It contains a few scenes not included in the other DVD sets below. A Two-DVD package published by Image Entertainment contains one DVD with the complete movie as well as trailer and introduction by Taylor Hackford. The other DVD contains pure bonus material of highest interest to a Chuck Berry collector. Here we get various clips taken during the rehearsals at Berry Park in Wentzville which have not been used in the film. There are absolutely great performances such as a guitar jam of Berry, Clapton and Richards, or a fantastic recording of Etta James singing Hoochie Coochie Man, eh... Girl. In addition there is a one-hour "Making-Of" of the film including deep insights of the chaotic production. A Four-DVD set (Image Entertainment ID3156THDVD, 2006) was released by Image Entertainment concurrently with the Two-DVD package. It contains the same two DVDs plus what Hachford calls "Witnesses to History". These are interviews taken for the film but used only in very small excerpts. Here you see the complete several hours long interviews with Bo Diddley, Little Richard, Jerry Lee Lewis, Willie Dixon, Roy Orbison and more. There is also more Chuck Berry material such as Chuck and Robbie Robertson digging through Chuck's collected memorabilia. The four DVDs contain everything that is in the other sets except for a discussion between Berry and Eric Clapton about their musical influences which is only on the Starbucks DVD. Anyway the four-DVD box is the one to buy . Be aware, though, that for an unknown reason the DVD is region coded. Currently the 4-DVD version does not work on DVD players outside of North America, while for the 2-DVD version there are different variants coded for North America and for Europe. When purchasing, check to get a version you can watch. 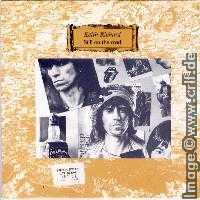 Excepts from the show have appeared on a number of records and CDs. The soundtrack album Hail! Hail! Rock 'n' Roll (MCA LP 6217 ) contains live versions of Maybellene , Around and Around , Sweet Little Sixteen , Brown Eyed Handsome Man , Memphis , Too Much Monkey Business , Back in the USA , Wee Wee Hours , Johnny B. Goode , Little Queenie , Rock and Roll Music , and Roll Over Beethoven . In addition there is a version of I'm Through With Love recorded during rehearsals. 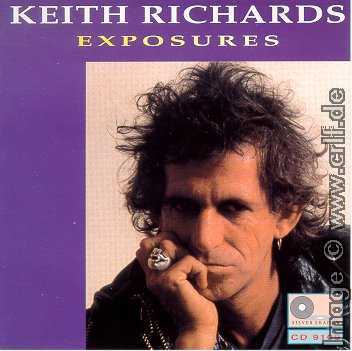 Keith Richards of the Rolling Stones was the musical leader of the All-Star Band and, of course, wherever a Stone performs, collectors and bootleggers are around to capture every single note played. There are, therefore, three bootleg recordings containing parts of the show and segments from the rehearsals. Two additional songs from the show have been made available on a bootleg album called Keith Richards - Still on the Road (Papa Records DS011, 1988): Everyday I Have the Blues and a lengthy untitled Instrumental. Two songs from the show's rehearsals filmed at Berry's home can be found on a bootleg CD called Keith Richards - Exposures (Silver Shadow CD 9109, 1991): Come On and Carol. In addition this CD contains some talks by Keith about Chuck and a heated discussion between the two, which occurred during the rehearsals. The audio quality is bad, having been taken from a very poor video tape copy of the film. Finally in 2000 bootleggers created a two-CD set incorrectly called Hail! Hail! Rock 'n' Roll Rehearsals (no label, no number, probably from Japan). Even though they did not manage to spell Keith's name correctly, the CDs themselves - which are just burned ones, not pressed - are of very high quality. You'll find many more recordings from the two shows: Wee Wee Hours, No Particular Place To Go, Instrumental, Keith's Rock 'N' Roll # 1 (Jo Jo Gunne), Keith's Rock 'N' Roll # 2 (Havana Moon), Eric's Blues, Rock And Roll Music, Reelin' 'N' Rockin', Wee Wee Hours, Chuck's Rock 'N' Roll # 1 (Havana Moon) (part), Chuck's Rock 'N' Roll # 1 (Havana Moon), Chuck's Rock 'N' Roll # 2 (Jo Jo Gunne), Everyday I Have The Blues, and Rock 'N' Roll Music. 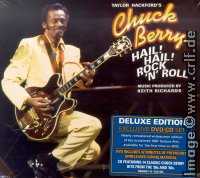 To promote the DVD sets released in 2006, Tres Hombres Productions (Paul Rappaport, Jym Fahey, Mitch Maketansky) created a one-hour music-intensive radio special called Chuck Berry: Hail! Hail! 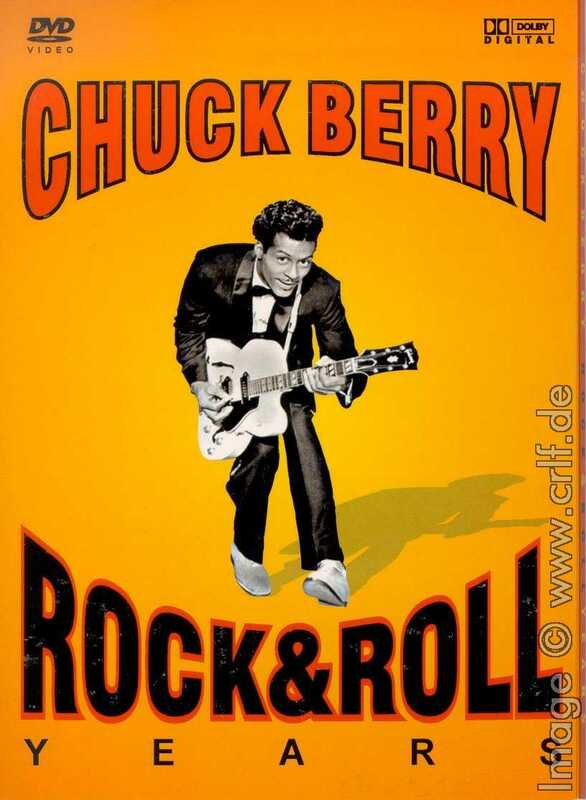 The King of Rock 'n' Roll. The radio show was distributed by Cahn Media to broadcasters in the U.S. at no cost. As far as I know the show was sent out on individual CD-R media and not as a pressed CD like the commercial pre-produced radio shows from UniStar and the like. The radio show contains many live segments taken from the birthday concert together with introductions and explanations by director Taylor Hackford. Also some short dialogue segments from the movie can be heard. Interestingly this radio show CD comes with several songs which are not on the official soundtrack album. The Concert Vault is a commercial website which hosts a huge number of concert recordings from different sources. 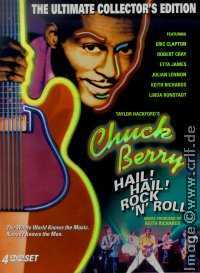 There are a few Chuck Berry concerts available at the Concert Vault, including the complete second show recorded for the film. 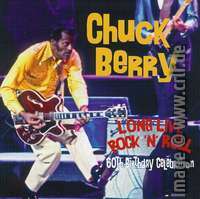 In 2015 an edited version of the recording available at Concert Vault made it to a bootleg CD called Long Live Rock 'n' Roll - 60th Birthday Celebrations (Crying Steel Records CSR03, 2015). In addition the CD includes the audio tracks of seven concert songs previously available only on the DVDs. A film, a soundtrack album. a radio show, and three bootlegs, what more could a poor boy want? Well, in fact there is more. As stated above, collectors are looking for every single note Keith plays. And in every Stones concert there is someone taping the show on a cheap cassette or Minidisc recorder. This concert was no exception. Within the collectors community you can find tapes not only from both shows, but also from the dress rehearsal which took place the day before the shows. The sound quality is pretty bad and it is clear the aforementioned bootlegs are not taken from these tapes. They are, however, useful to get an insight into how the film was produced. Following is a complete list of the shows used to create the film. You'll find every song played and where you can get it. This detailed list is a joint work between me and fellow researcher Claude Schlouch. A segment of the film presents excerpts from a gig played at the Cosmopolitan Club, St. Louis. Chuck plays along with Johnnie Johnson (piano), Frank Dunbar (dms), Chuck Clay (bs), and Ingrid Berry (vcl). 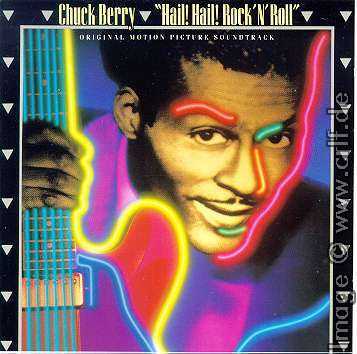 A small interview segment of the film with Chuck presenting the Cosmo has also been used on a radio station record by Westwood One Radio Networks (see the chapter on Radio Show and Promotional Records) and as such landed on a bootleg cassette Chuck Berry Interview 10-17-1988 (GFP K0097, 2000). Between October 10th and 14th, 1986 the band rehearsed for the shows to be filmed. Some of these rehearsals were filmed, displaying the often complicated process of getting decent recordings from the headstrong members of the band, particularly Mr. Berry. The "Chuck Berry Band led by Keith Richards", as Berry puts it, consisted of Johnnie Johnson on piano, Joey Spampinato (NRBQ) on bass, Bobby Keys on sax, Chuck Leavell on organ, and Steve Jordan on drums. The latter three having performed with Keith many times before. Also participating in the rehearsals were some of the guest stars. Pass Away (Poem) 5:21 Four-DVD set Chuck recites the poem, an adaption of Theodore Tilton's The King's Ring (Even This Shall Pass Away), accompanied by Robbie Robertson of The Band on accoustic guitar. Chuck also recites parts of the poems The Day Is Done by Henry Wadsworth Longfellow and Vagabond's House (My Pad/My Dream) by Donald Benson Blanding. I'm Through With Love 2:15 Film and soundtrack album on the soundtrack album you hear Chuck and Johnnie finishing a rendition of Nat Cole's The Frim Fram Sauce right before I'm Through With Love starts. 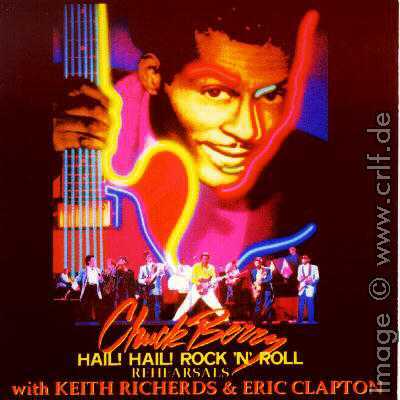 An interview segment recorded during the rehearsals taken from the movie was used for a short 7-minute "Blues Break" created by House of Blues Productions (CBS) for broadcast on April 21, 1994. Berry talks about his influences and the show continues with Louis Jordan's "Blue Night Boogie" (see the chapter on Radio Show and Promotional Records). "I gotta save my voice for tomorrow," he [Chuck] argued. Keith tried to cajole Chuck, but no way. Instead Chuck played his lyrics on the guitar, thus making the run-through virtually useless. "Just once," Keith pleaded, actually kissing Chuck on the cheek. Such a tender moment! Chuck gave in, halfway, by whispering the lyrics to songs like "Memphis" and "Sweet Little 16." Other times, the words, "Keith, you gotta let me do it my way," were a familiar utterance from Chuck. As we learn from the Making-Of segment of the DVD sets, Chuck had performed a concert in Ohio only a few days before and lost his voice almost completely. What the 4500 fans were about to see was not a concert per sé. The majority of them were disappointed by the many lengthy interruptions from the film crew to reload film or check on things. (A phenomenal show, no matter how you diced it. But that was just the point - It was diced!) It seemed, there was a break after each song. "This is Hollywood!" Chuck reminded us. "I feel like a bull," Chuck added, a possible double entendre. He was actually referring to the person on the side of the stage who held up a red card that acted as a stop sign to the band. Action halts when the card is up. To fill the awkward pauses, Chuck began reciting poetry, as Keith and the others paced around the stage. There was no impromptu jamming at first. "The reason we can't jam," explained Chuck, "is that when we get into a groove, we won't want to stop." So folks who left their seats for a few minutes were able not to miss some great guest appearances. Finally they couldn't deny us any longer. During the next pause, Chuck said, "Let these guys play the blues," allowing Keith and Eric to wail away and trade licks, as the audience howled. Another reason for not jamming is told by drummer Steve Jordan on the DVDs: They simply were exhaused by backing Johnnie Johnson's Boogies over and over. Almost two hours of the show were recorded by a fan so we get a chance to listen also to the false starts and repeats. Better and/or edited excerpts are available on the soundtrack album, in the film itself and on the bootlegs. Around and Around 2:22 Soundtrack album and Audience Tape. Vocal on the soundtrack album seems to be overdubbed as it is notably different. Little Queenie 3:25 Film, radio show, and Audience Tape. On the Soundtrack album edited to 3:37. The second concert ran a lot smoother. There were only three breaks the whole show, and this time, the crew realizes it wisest to let the band take part in impromptu jams to fill the void. And wouldn't you know, while most of the cameras weren't rolling, Etta James stepped up and led the band through the most incredible rendition of "Hoochie Coochie Man" that anyone's ever heard. Mouths hung open. For the finale of "School Days," all the guests (plus Joe Walsh and Chuck's daughter Ingrid) came back out as Chuck rolled onto stage in a red Cadillac convertible. The confetti was flying, and over 4500 people toasted the sexagenerian. Uncle Chuck, here's to another sixty! Etta James's version of Hoochie Coochie Man did not make it to the film, but on the DVDs there is at least a rehearsal version, which truely is fantastic. Welcome 1:58 Concert Vault and Long Live bootleg. Tiny 16 seconds segment also in film and soundtrack album. Maybellene 2:16 Soundtrack album, Concert Vault, Long Live bootleg and Audience Tape. For the album the vocal track from the original show was removed and replaced with a completely new vocal track. Roll Over Beethoven 2:57 Film, Soundtrack album, radio show, Concert Vault, Long Live bootleg, and Audience Tape. The original recording has a very poor vocal track. For the album this was replaced by a completely new vocal track. The version used in film and radio show has been edited down to 2:40 and uses yet another vocal track. Thus there exist three variants each sung differently. Instrumental 2:18 Audience Tape. Segment of 0:45 on Long Live bootleg. The following three recordings could not be identified on any of the audience tapes. Probably they were recorded while the tapers changed cassettes. It may also be that these songs were created in the cutting room or sound studio from various of the recordings above or even later overdubs. 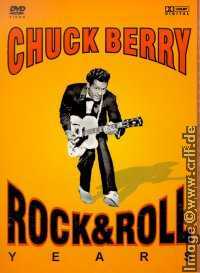 Due to Chuck's bad voice which can be heard very good on the Concert Vault recording, some segments of the filmed shows have been overdubbed in an L.A. studio several weeks later. This means that what you hear in the movie or on the soundtrack album is not necessarily what was recorded in the show. For Roll Over Beethoven not even the movie and the album versions match. A complete discussion of the contents of the soundtrack album and its edits against the original recordings is covered by an article in the blog which goes along this site. Chuck's 60th birthday was the next day: October 18th, 1986. And again on this day a birthday concert took place, this time at the Felt Forum, New York. According to visitors of that show and judging from an audience tape, with Dave Edmunds on guitar, John Entwistle on bass and Chuck Leavell on keyboards this must have been a great concert as well.